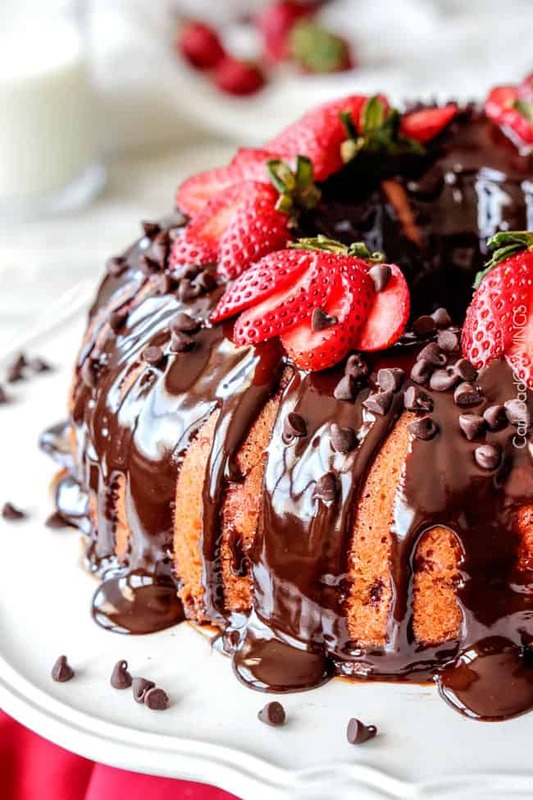 Rich, buttery, tender Strawberry Pound Cake swirled with fresh strawberries and smothered in smooth, silky Chocolate Ganache. 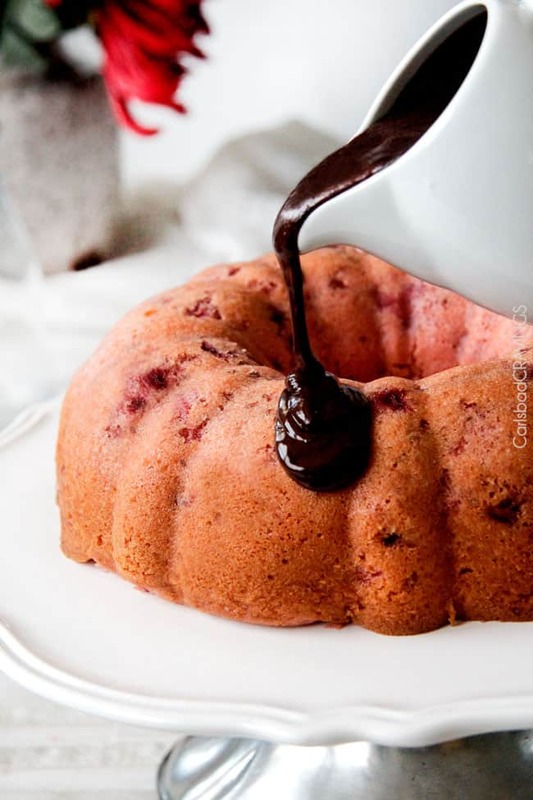 This Strawberry Pound Cake recipe is my ode to a Chocolate Covered Strawberry! It boasts the fresh, tangy sweetness of strawberries complimented by the rich, decadence of chocolate. 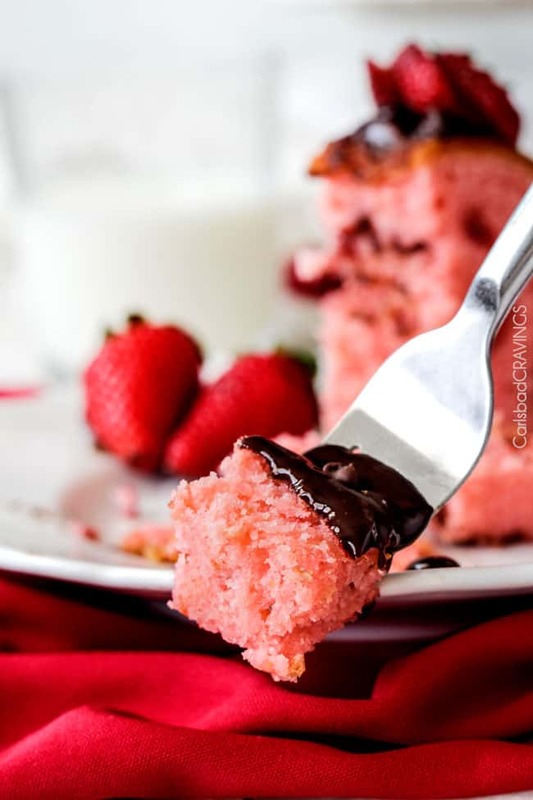 This Strawberry Pound Cake is 1000X better than any strawberry cake mix and so drool worthy everyone will beg you for the recipe. BEG I tell you! It’ summer so it’s time for strawberries! 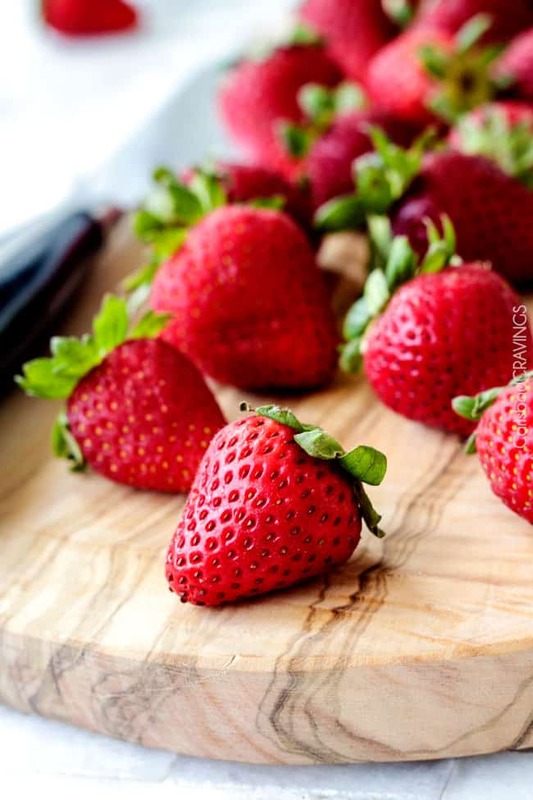 Because strawberries are amazing and juicy and sweet. And because I crave strawberries every time I pass them in the store and every time I drive past the fields and fields of strawberries by my house. And because Cream Cheese Stuffed Strawberry Coffee Cake, Strawberry Cheesecake Pie, Strawberry Shortcakes, Strawberry Syrup, Strawberry Salad, Chocolate Covered Strawberries and now this Strawberry Pound Cake! Are you giddy for strawberries yet?! I first started this Strawberry Pound Cake recipe with my own adaptation of the popular strawberry cake recipes that start with a white box mix and add gelatin. The cake was good, but not amazing. So I decided to take my favorite ever sour cream pound cake recipe and add fresh strawberries and strawberry gelatin (Jell-0) to the mix. Best decision ever. 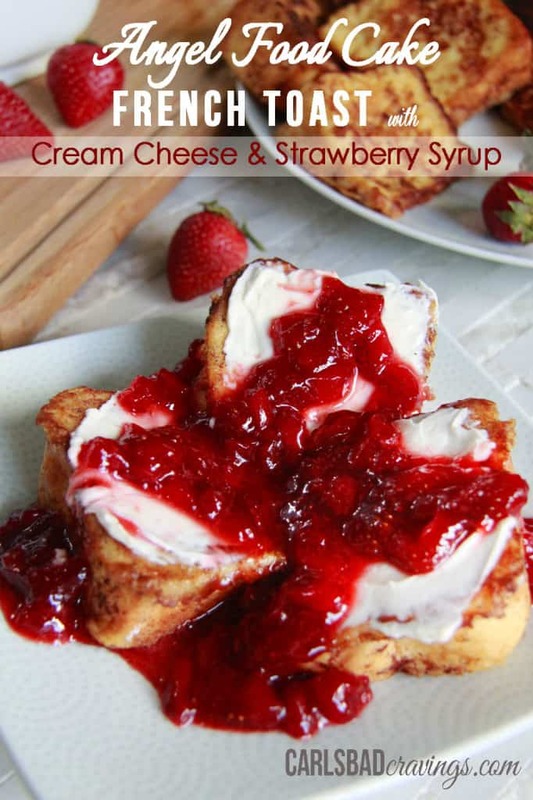 Best Strawberry Pound Cake recipe ever. The Strawberry Pound Cake is rich, and soft and super moist and tastes like strawberries! Its way better than the box kind with only 10 minutes more effort. So worth it. I could have topped the cake with a lemon glaze and I am sure that still would have been delish, but the cake’s richness demanded an equally decadent adornment AKA 5 Minute Silky Chocolate Ganache. To live for. Don’t let the word “ganache” scare you. As you might have guessed – it takes less than 5 minutes to make and is smooth, creamy and chocolaticious! 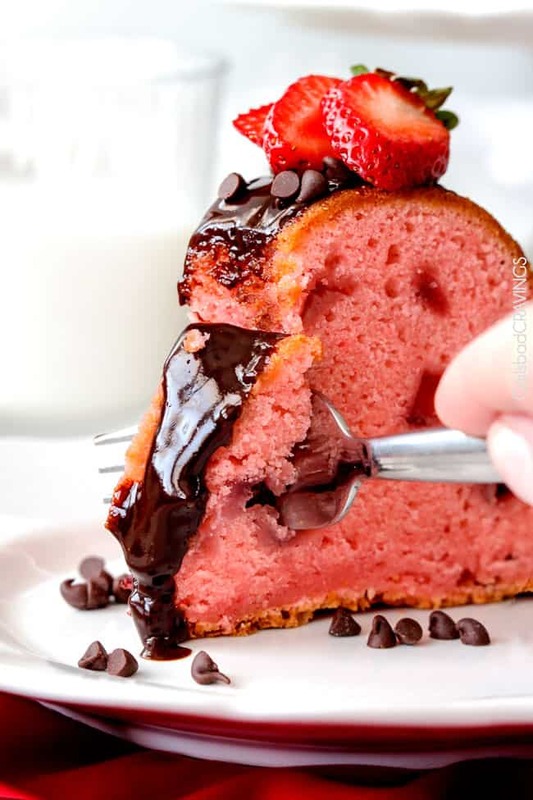 So every bite is chocolate covered moist, rich Strawberry Pound Cake. Possibly the very best bite of summer. Looking for more Cake Recipes for Summer? 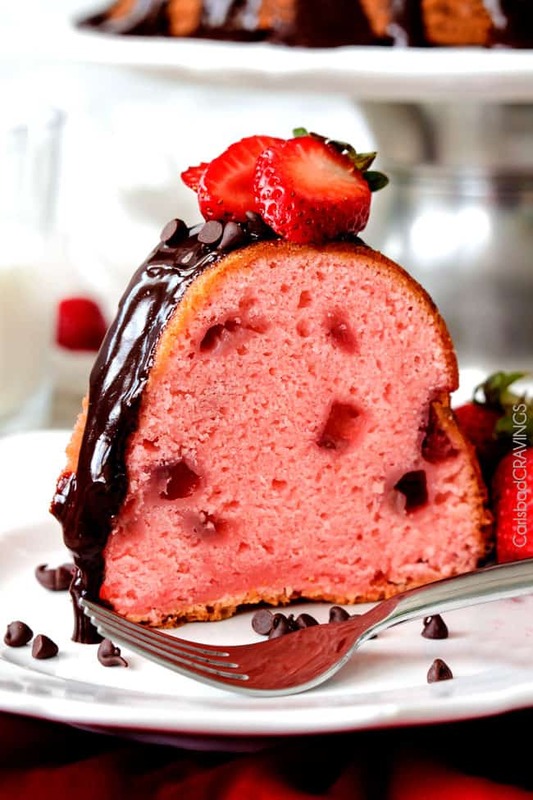 Want to try this Strawberry Pound Cake Recipe? Pin it to your CAKE, SUMMER or CHOCOLATE Board to SAVE for later! 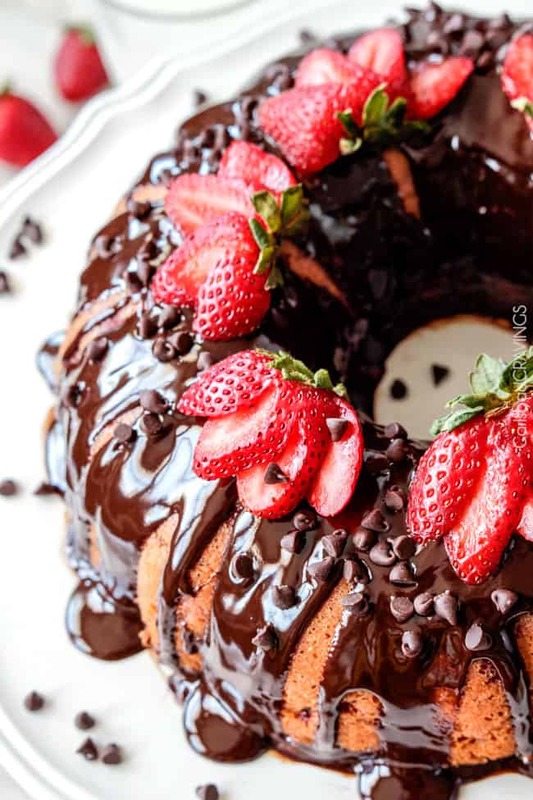 Rich, buttery, tender Strawberry Pound Cake swirled with fresh strawberries and smothered in smooth, silky Chocolate Ganache. 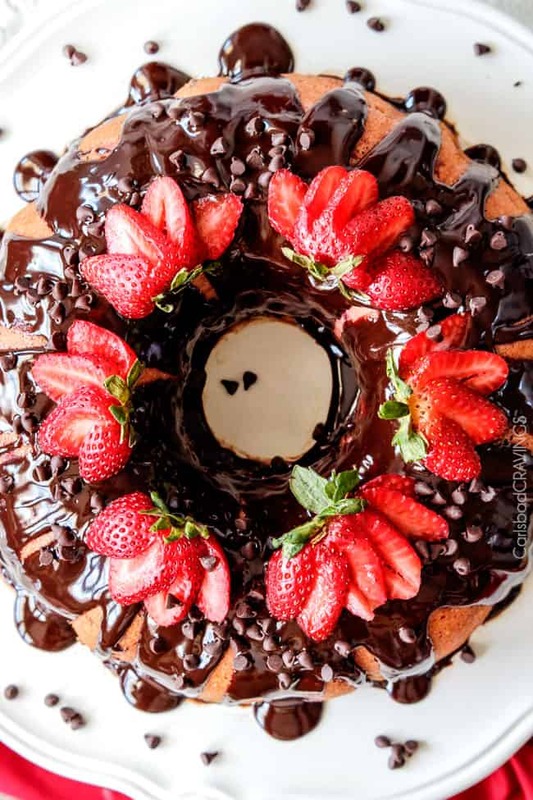 This Strawberry Pound Cake recipe is my ode to a Chocolate Covered Strawberry! It boasts the fresh, tangy sweetness of strawberries complimented by the rich, decadence of chocolate. 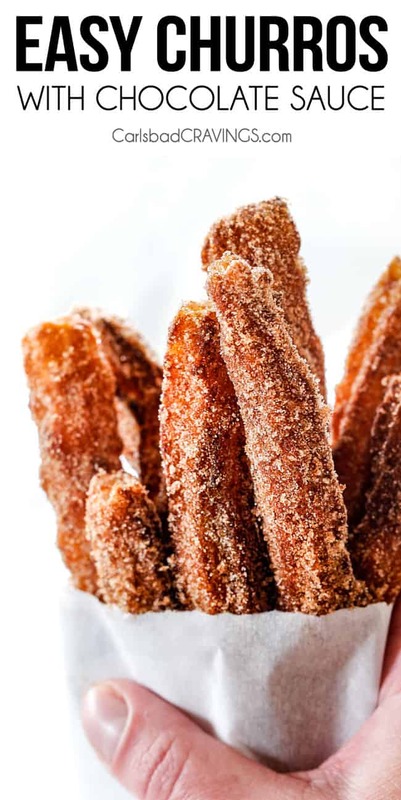 Preheat oven to 325F degrees and generously spray all surfaces of a 12 cup nonstick bundt pan with nonstick cooking spray WITH FLOUR*, OR grease and flour the inside. Set aside. Sift the 3 cups of flour, strawberry gelatin, baking soda and salt into a medium bowl and set aside. 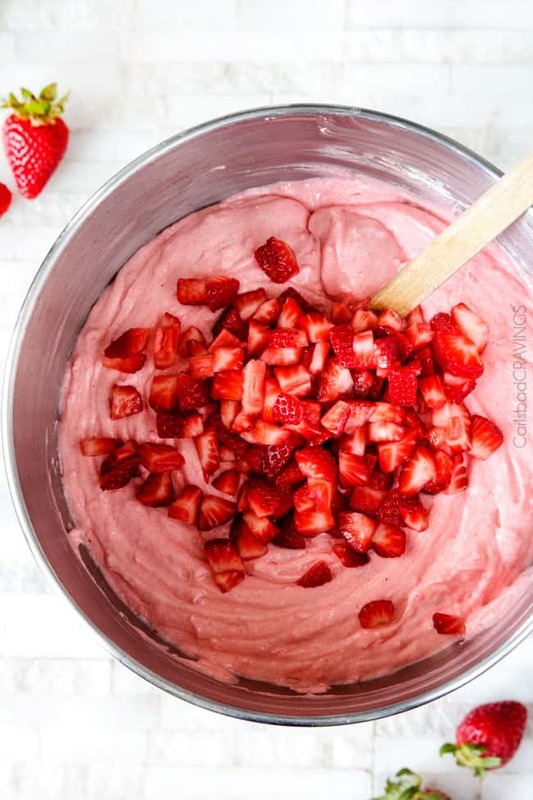 Turn off mixer and add vanilla extract, lemon extract and strawberries and gently fold into batter until combined. Spoon batter into prepared pan and tap pan on counter a few times to even and release air bubbles. Bake until a wood pick inserted near the center of cake comes out clean, 85 – 100 minutes (mine took 93) minutes. You may need to cover the top of the cake with foil near the end of cooking time to prevent excess browning. Let cake cool in pan for 10 minutes then remove from pan, and let cool completely on a wire rack. When cake is cool, prepare Chocolate Ganache. Spoon half of Chocolate Ganache over cake. Spoon remaining ganache over individual servings. **Cake will rise slightly above bundt cake pan when done so be sure not to overmix eggs or sour cream/flour to add extra volume. ***Cake can be made 2 days in advance then wrapped in plastic wrap when cooled. I actually think it tastes better the day after baking. The cake looks fab!! I just have two question, if I don’t have a sour cream can I use cream 35%? And how to make a strawberry gelatin? Thanks Radima! If you don’t have sour cream, I would use Greek or vanilla yogurt instead. Strawberry gelatin is purchased at the grocery store it is also known as strawberry Jello. Hope this helps! I made this cake yesterday for a potluck and it was the hit of the night! SO moist and everyone loved the chocolate sauce. Thank you so much for such a delicious dessert and beautiful too! You are so welcome! I am thrilled it was “the hit of the part” – yay! Thanks Heidi! I love making cakes because they are easy – no fuss dessert for crowds. I made your Lemon Poke Cake last week and LOVED it so I was super excited to make this Strawberry Cake. It is also awesome! Thank you for two new favorite desserts! Hi Sara, I am so happy you enjoyed both my Lemon Poke Cake and this Strawberry Cake! Thanks for making my day! I hope you find more to love here! Your strawberry pins cake looks fabulous. I’m looking for a recipe for a a strawberry wedding cake and it needs to be a dense. Ake like a pound. Have you ever baked your pound cake in regular round 3″ deep cake pans? Hi Felicia, I have never made cupcakes with this recipe but I don’t see why not! Enjoy! We are thinking about making this for a school project!!!!!!! What are some good fruits you think we could add to make it stand out even more? Hi Vioilet! I personally would just stick with the strawberry and let that flavor shine but you could also add some other berries as well. Enjoy! 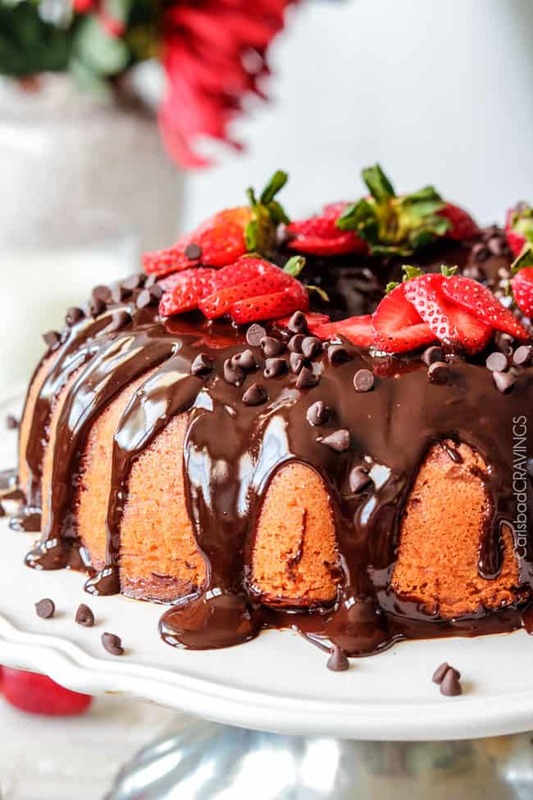 Can I bake this cake without using fresh strawberries as they aren’t available in this season ? Does it matter if the strawberry jello mix is sugar free or not? I’m looking at the boxes I have of sugar free strawberry jello.. some are .3 oz and some are .6 oz.. it seems that 3 oz would be many boxes?